An excellent synth, the lack of mixer section notwithstanding, with a very distinctive tonal colour. A great emulation of a characterful little mono synth. Excellent MIDI control possibilities. A clever macro and linking system to make simple but powerful performance controls. The Doepfer MS-404 is a great little mono synth along the lines of the Roland TB-303 but with a few significant additions such as two LFOs. 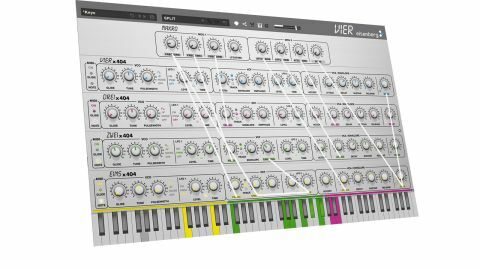 Eisenberg has taken it a stage further with its new emulation, dubbed Vier, giving you four polyphonic modules which can be linked together or set to individual MIDI channels. "If you like performance controls, you will love this as the possibilities are endless"
With all modules set to the same MIDI channel, there are six playing modes which do the following: Unison: all four play simultaneously. Split: each module has a range set by dragging its related colour bar over the keyboard. Revolver: each new note swaps to the next module. Random: as Revolver but random! Chord (blow): chords are split intelligently with lowest notes going to the first module and highest to the last. Chord (grow): notes are split lowest to highest and when there are more notes than modules it starts again from the first module. It is also possible to link a knob on any module to any other knob on any other module by left-clicking and holding on the name below the knob and dragging to the desired destination. There is no limit to the number of links and you can then link to one of eight macro knobs which can again have any number of links. All links are relative so, once you have set up a sound with all four modules, you can then put together some incredible control patches and, thanks to the MIDI implementation, every knob has its own cc number (and you can easily edit them). If you like performance controls, you will love this as the possibilities are endless. The modules themselves are pretty straightforward as the 404 is a very simple synth. The two LFOs control the pulse width or FM modulation of the oscillator and the filter cutoff respectively and the rest is very much self-explanatory. Our initial reaction when flicking through the sound library was that it sounded a bit ordinary and thin. It was only when we started to get into layering modules together and thickening up sounds with some modulation and detune that it really came to life, but that also was the moment when we got our biggest surprise. You can't pan individual modules in a stereo instance and there are no individual level controls, ie in audio terms it is mono. That said, we love the sound of it. It takes us back to our Düsseldorf days. Crisp clean tones with some strident modulation possibilities and, with the addition of a bit of drive, a hard edge that can go deliciously nasty. The Vier is certainly a great addition to the sonic armoury as it has a truly individual sound and, with the addition of pan and level controls, it could well become a classic. The MS-404 was discontinued some time ago so this is the best way to get your hands on four of them... and it's a bargain.